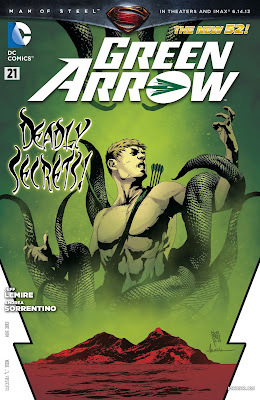 Green Arrow #21 - "I was Oliver Queen. I was the Green Arrow. But now I'm no one and nothing." It's amazing you know, I used to only liked Green Arrow as a fun character to mock, but every issue of this comic since Lemire and Sorrentino took over the book has sold me further on the character. I know I say this every month, but it just blows my mind how much better this comic has become...from a book I had to talk myself into buying once a month into one that I really look forward too! Now I can't wait to see what comes next! What other 4 comics did I pick this week? One way to find out...after the JUMP! 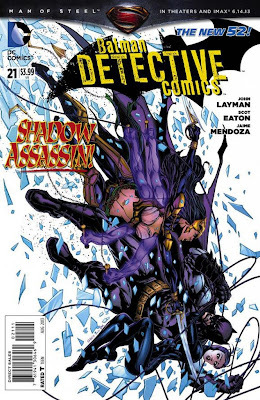 Detective Comics #21 - "Out-of-towners. They don't know Gotham. They're unprepared for what hits them. And even less prepared for what's about to." Bruce Wayne is hosting some big political shindig at Wayne Tower this month...specifically so that BATMAN can monitor the situation, which is obviously rife with potential for assassins, terrorists, super-criminals and psychopaths. Hey, it's Gotham City, right? What else is new? Big difference this time...municipal electrical worker and sometime Bat-punching-bag Harper Row is working the party, troubleshooting the electrical grid...and keeping an eye out for trouble, herself, despite Batman telling her in no uncertain terms NOT to DO that. Well, go looking for trouble and it's not hard to find...Harper spots a mysterious lady sneaking around and decides to follow her...soon enough it becomes clear that yes, she's an assassin! Also a meta-human. ALSO someone with a mysterious connection to Bruce's past! Can Batman save Harper and also stop this lady of shadows? Oh we also get a Man-Bat back-up story this issue! It's cool, but still jarring that they are treating Man-Bat as a "new" character when he's been used in Batman Incorporated since the earliest issues...retcon anyone? Regardless, both main and back-up story are very well done and entertaining! Detective Comics continues to be a very strong book! 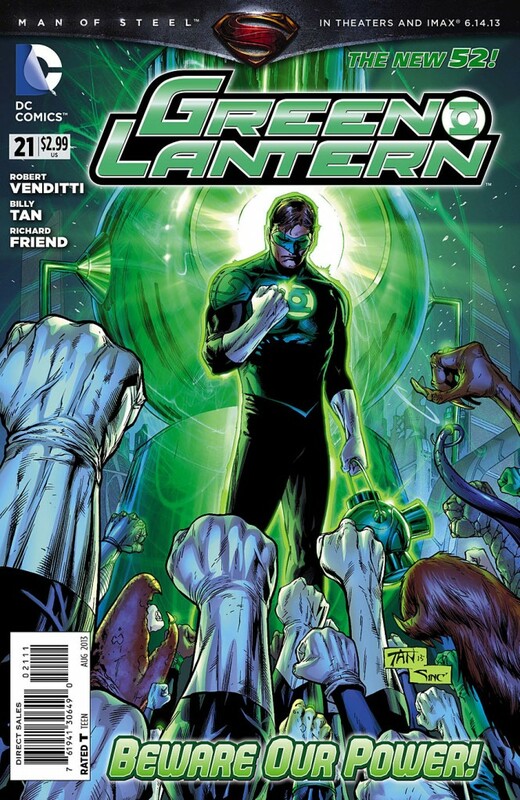 Green Lantern #21 - "We're done for. The Central Power Battery is dead." An all-new creative team takes over Green Lantern this month after the amazing Geoff Johns' finale in issue #20! 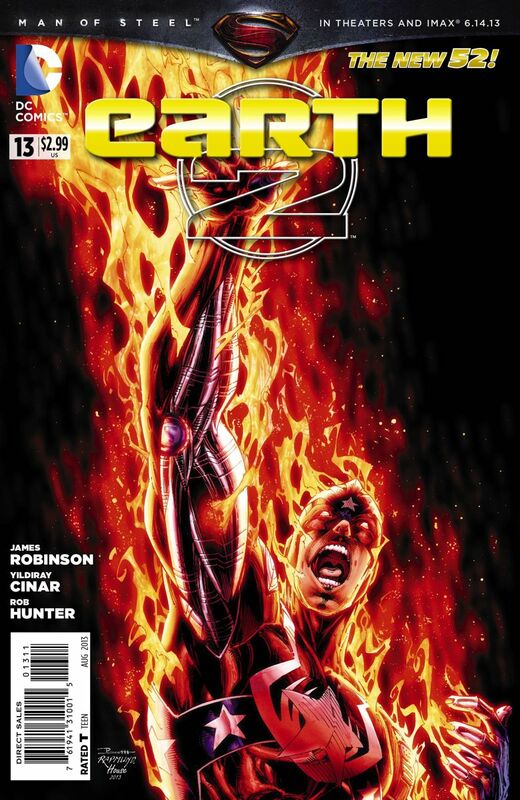 Tough to follow his run, but new writer Robert Venditti and penciller Billy Tan are going to give it a shot! Since the old, mad Guardians are gone and the new Guardians have been imprisoned for millennia and are thus a little out of touch, it is decided that the miraculously returned Hal Jordan is going to be put IN CHARGE of the Green Lantern Corps!! Anyone who's met Hal isn't too sure that's a good idea...including Hal himself! Nevertheless, with the Corps decimated by the First Lantern, there isn't much choice in the matter. Someone's got to hold things together! Especially considering, with the Lanterns in a weakened state, it doesn't take long at all for some force to attack Oa itself!! For the more romantically inclined, there's also some character-building between Hal and Carol "Star Sapphire" Ferris...can those crazy kids ever work things out?? 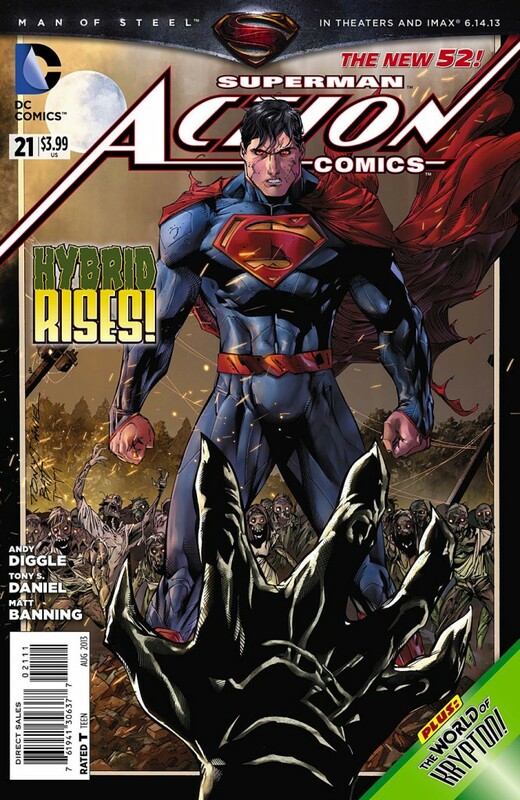 Action Comics #21 - "You are a scourge on this planet. Your kind is not welcome here. I will show you the way off." Also this issue is "The World of Krypton" part 2, starring a young Lara Lor-Van, aka Superman's (biological) Mom...and of course, featuring that ever-so-popular absent minded scientist, Jor-El. Political strife and natural disasters on a doomed world! What's not to like? Earth 2 #13 - "So regarding Captain Steel--Remind me what's so special about this man?" ANNND there you have it! Fun week! Don't forget about New Comic Book Day tomorrow! 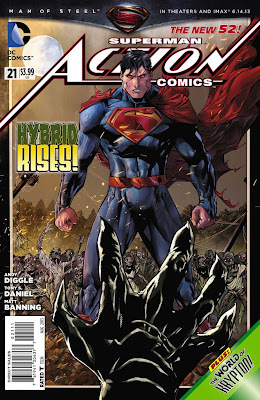 It's a HUGE one, with the release of the very first issue of new Scott Snyder/Jim Lee Superman title, SUPERMAN UNCHAINED #1!! Not only that, but tomorrow's Batman #21 starts the New 52 Batman origin story ZERO YEAR! If there's not enough Superman or Batman in your life, here's your jumping on point!! All right have a great week folks! Peace!